A private rocket NASA is counting on to make robotic cargo flights to the International Space Station achieved a key milestone today (Oct. 1), as its first stage rolled out to its Virginia launchpad for the first time. 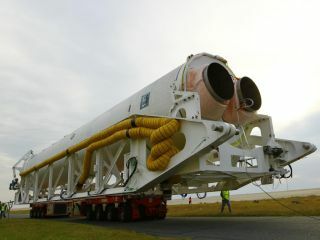 The first stage of Orbital Sciences' Antares rocket arrived today at its pad at the Mid-Atlantic Regional Spaceport (MARS), which is located at NASA's Wallops Flight Facility in eastern Virginia. The move marks the beginning of on-pad preparations for a series of important trials with Antares that will take place over the next few months, Orbital officials said. The company aims to perform hot-fire tests of the first stage in four or five weeks, followed by Antares' first test flight about a month later. If all goes well, Antares will then launch Orbital's unmanned Cygnus capsule on a demonstration mission to the space station, officials said. The first stage of Orbital Sciences' Antares rocket arrives at the pad at NASA's Wallops Flight Facility in Virginia on Oct. 1, 2012. The hot-fire operation will demonstrate the readiness of Antares' first stage and launch pad fueling systems to support the upcoming flights. The test involves firing the rocket's dual AJ26 engines — which will be held down on the pad — for about 30 seconds, generating a combined total thrust of 680,000 pounds (308,000 kilograms), officials said. Antares is slated to blast off on its maiden journey about a month after the hot-fire test, carring a Cygnus mass simulator whose instruments will gather data about the flight. The rocket will also carry and deploy four minuscule "picosatellites" during the mission, officials said. Finally, Antares will carry Cygnus aloft on a demonstration mission to the orbiting lab. The capsule will autonomously rendezvous and berth with the space station, delivering about 1,210 pounds (550 kg) of supplies. On its way back down to Earth, Cygnus will carry 2,200 pounds (1,000 kg) of disposal cargo from the station, officials said. If all goes well with these three tests, Antares and Cygnus will be ready to begin making bona fide supply runs to the space station for NASA. Virginia-based Orbital holds a $1.9 billion contract to launch eight such unmanned flights. NASA also signed a $1.6 billion deal with California-based SpaceX, which is slated to launch the first of its 12 unmanned supply flights to the station this Sunday (Oct. 7). This past May, SpaceX's Dragon capsule aced its demonstration mission, becoming the first private vehicle ever to dock with the $100 billion orbiting complex.